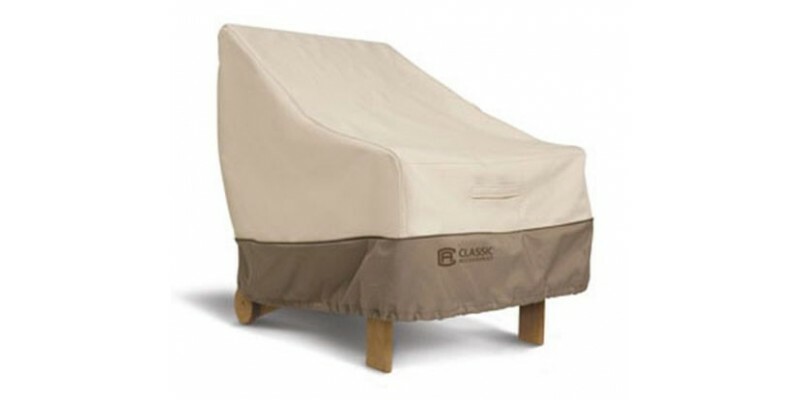 Heavy-duty fabric cover protects patio lounge style chairs against weather damage and dir. Gardelleﾙ protective fabric system features an elegant fabric top with a water repellent and resistant PVC under-coating and a protective splash guard skirt. Tough interlocking seams add strength and durability. Special treatments ensure fabric wonﾒt crack in cold weather. Click-close straps snap over legs to secure cover on windy days. Air vent reduces inside condensation and wind lofting. Padded handles for easy fitting and removal. Elastic hem cord with a toggle allows adjustment for a tight and custom fit. Three year warranty.